It isn't often I find a recipe one day, bake it the next and am already planning when to make it again! But this Pumpkin Fruit Cake from The Healthy Chef was calling my name the moment I saw it. I was looking for something sweet but healthy to bake for after kindy, that was also nut-free to include in Oscar's lunch box the next day. This recipe was not only easy but I already had all the ingredients. I adore pumpkin baked goods but unless I happen to have leftover steamed pumpkin already in the fridge I can never be bothered to make them. This recipe however, just calls for grated raw pumpkin. Genius! The end result was identical to cakes that use pumpkin puree. It was mixed and in the oven in about 5 minutes. YUM. 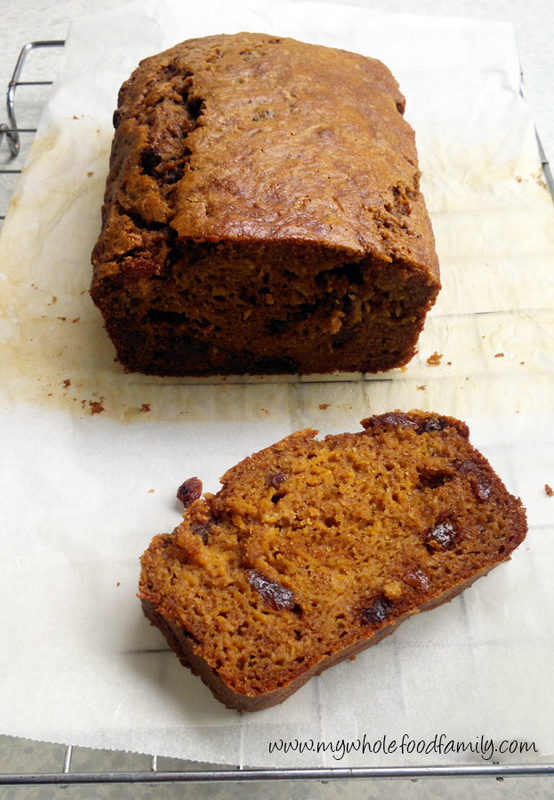 Incredibly moist, subtly spiced and filled with little bursts of extra sweetness from the sultanas. We ate half the loaf warm from the oven and stashed the rest for snacks. I will be making it again next week! Excuse the bad photo. It's a dreary grey day here, not great for photos but perfect for cake. Preheat the oven to 170 degrees C/ 150 C fan forced. Grease and line a loaf pan (mine was pyrex). Combine the raw pumpkin, eggs, vanilla, oil, zest, rice malt syrup, bicarb, baking powder, spices and sultanas in a mixing bowl. Fold through the spelt flour. Spoon into a prepared tin and bake for 1 to 1 1/4 hours, covering the top with foil if necessary (mine was done in exactly 1 hour, no covering required). The cake will spring back when pressed lightly. Allow to cool in the tin for 30 minutes before turning out.